Collaborative learning teaches students to rely on each other in problem solving instead of going to their teacher. Even though the College Preparatory School is an elite school, schools with fewer resources can replicate College Prep’s collaboration practices. The collaborative-learning style incorporated into the fabric of the school helps students to be resilient by aiding them with identifying their resources (peers) and testing their theories to see if they are on the right track all while developing habits of mind that form the foundation of scholarship. To make this approach work, teachers must be willing to “cede the floor” to the students. Other things to consider are the need to create an effective classroom geography, focus on the process, build accountability, let students teach one another, and encourage students to be in tune with one another. In math classes, the students sit face-to-face in groups of four tables to collaborate. 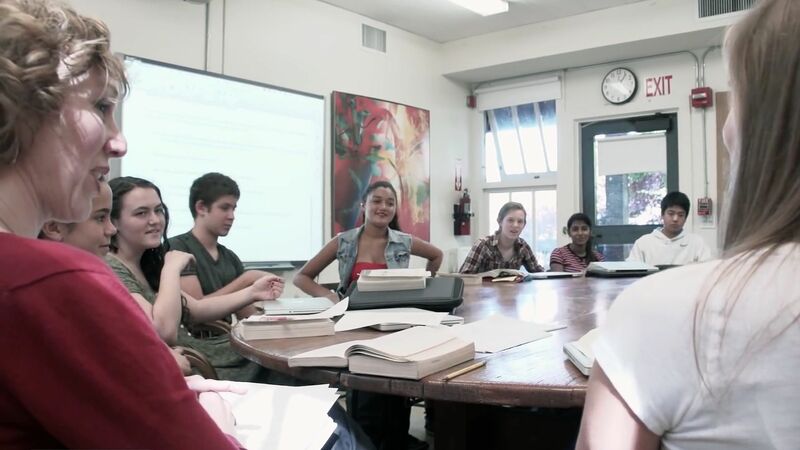 In English classes, students sit around a Harkness table (a large wooden table capable of seating the entire class), which allows every student to see the teacher and all the members of the class as they speak. The foundation is that students come prepared to discuss and collaborate. In math, four times a year, each student is given a set of values or codes to substitute in the equations so that even though the students are working together, they have to focus on the mathematical process and not just the “right answer.” In English, the discussions are open-ended, allowing for multiple right answers. In math classes, students frequently take group tests and can consult with one another on the answers, but the teacher chooses only one test at random to grade for the group. Because the group work is intentionally more difficult, this process keeps individual students accountable for full participation in group work. To measure how well the groups work together, the teacher also gives out a group-collaboration grade for each unit, which is worth 10 percent of a student’s grade. While students participate in the group discussions around the Harkness table in English, the teacher selects one student to be the moderator and another to be the discussion tracker who records the flow of the conversations. The moderator can look at the discussion tracker’s notes and see which students he should invite to chime in. In math and English, teachers cede the floor to students so they can teach one another. In math class, students are given challenging class problems that encourage them to seek ideas and advice from their group members. In English, juniors are grouped with seniors, which helps the younger students learn how the process works by watching and learning from the older students. Additionally, pairs of students are invited to lead the discussions. The English discussions are also held online, and students are required to participate and comment on at least two other student comments. In math classes, students are grouped intentionally to provide a mix of skill levels, which helps them to be more sensitive to group members’ needs. The teacher provides feedback on helping the groups interact well, which helps the more vocal students to step back and let the other students participate more. Every English class starts with a moment of quiet after which students are asked to share their energy and stress levels. Often teachers assign different roles that allow students to focus on the discussion: the scribe takes notes for the entire class, the moderator ensures a smooth discussion, and the discussion tracker maps the flow of the discussion. Data is from the 2012-13 academic year.